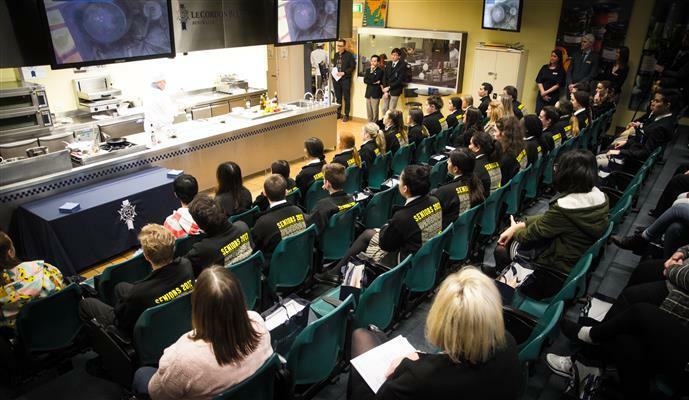 Our recent Adelaide Open day at Le Cordon Bleu Adelaide attracted a record number of attendees. This on-campus event offers potential students an opportunity to experience the world of Le Cordon Bleu, to explore their future education; their career dreams; and how Le Cordon Bleu can assist them on their journey. Our first session at 1pm was open to high school students and teachers, with a second session at 4pm for the general public. Guests met at TIROS restaurant where Sophie Davis (Senior Brand Manager) welcomed everyone warmly. First on the agenda was a much-anticipated sensory class by Wine Lecturer, Trevor Maskell. The class gave students the opportunity to sample sweet and sour juices (apple and grapefruit) as a way to explore the basic principles of wine tasting. Kerri Watton (Career Services Manager) and Hillaria Juliana (Alumni Officer) discussed the extensive support offered to students by Le Cordon Bleu Career and Alumni Services. Bachelor of Business (International Hotel Management) alumna Olivia McFarlane and Cert III Commercial Cookery alumnus Anthony Shin spoke about the benefits of studying at Le Cordon Bleu and their positive experiences as alumni working in industry. A tour of the institute was expertly handled by Luke Montgomery (Programme Manager) and Shannon Hall (Academic Manager VET) showcasing the state-of-the art facilities, including the cuisine and pâtisserie kitchens, training bar, brewery, and cheese academy. Le Cordon Bleu Chef Lecturer Steve Cooling impressed attendees with a wonderful cuisine demonstration of his recipe, ‘Cooling Red Cabbage Alsation-Style with Glazed Pears with Roast Pork’. In the Training Room Jenni Key (pâtisserie chef) presented delighted guests with an incredibledisplay of pâtisserie and chocolate items. Sophie Davies hosted students through the Cheese Academy & Brewery. Guests thoroughly enjoyed observing their first pâtisserie class, which offered a glimpse of student life at Le Cordon Bleu. An exciting and informative afternoon ended on a high note with a wonderful cocktail demo by current ADH students in the campus’s Training Bar. Returning to TIROS, guests were given the opportunity to chat with Le Cordon Bleu staff at the sales table. Thank you to all students, teachers and guests who attended our Open Day - we are delighted to be part of your further education and future career journey. Le Cordon Bleu Open Days are held concurrently at the Sydney and Melbourne institutes.